Rosie Fisher, National Center for Atmospheric Research, Boulder. "FATES: A Functionally Assembled, Terrestrial Ecosystem Simulator. Building better bridges between ecosystem science and Earth system modeling"
The inclusion of vegetation structure and demographics in Earth System Models allows both the representation of ecological processes of disturbance, recruitment and competition at their native scales, and also improved mechanistic treatment of many other ecosystem processes, including fire, nutrient cycling, plant hydraulics, land use change and management, plant allocation, ecosystem assembly and tree mortality processes. In this talk I will give an overview of the status and functionality of the open-source vegetation demographics module FATES (the Functionally Assembled Terrestrial Ecosystem Simulator, https://github.com/NGEET/fates), which is coupled to the Community Earth System Model (CESM) and the Energy, Exascale Earth System Model (E3SM). FATES recently incorporated a plant hydrodynamics scheme, enabling the prediction of current and future vegetation types that emerge from their hydraulic functionality, and opening up a new frontier for interactions between field observations, physiological theory and global land surface modeling activities. I hope to stimulate discussion into potential avenues for collaboration in the testing, development and deployment of FATESby the wider community, and to illustrate the benefits of open-source collaborative code development for accelerating progress towards better predictive understanding of the biosphere." 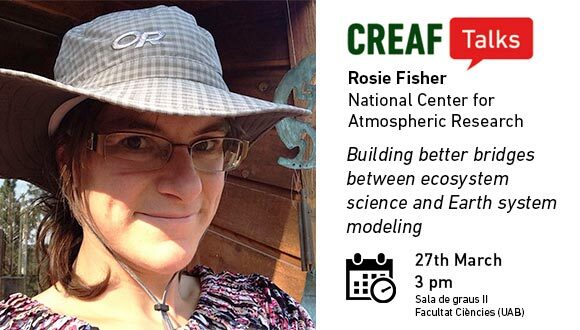 Rosie Fisher is a scientist at the National Center for Atmospheric Research in Boulder, Colorado. She is one of the primary developers of the Community Land Model (CLM), which is an open source collaborative project to develop the land surface scheme in the Community Earth System Model. As such, her research interests range broadly across the topics relevant to simulating vegetation processes in an Earth System Modeling context. Her primary research goal in her career at NCAR has been the integration of ecosystem demography into the CLM, an activity which has recently expanded to the Functionally Assembled Terrestrial Ecosystem Simulator project (FATES). Additionally, she led the re-design of the Nitrogen cycling component and the calibration exercise for the recent release of the CMIP6 version of the CLM (CLM5, https://github.com/ESCOMP/ctsm). Dr Fisher has long-standing interest in plant hydraulic processes, originating in her PhD field and modeling research at the Caxiuana rainfall exclusion experiment in North East Brazil, and most recently in using those same data to test hydrodynamic implementations in the big-leaf and demographic versions of the CLM. Her other interests include fire-vegetation feedbacks, radiative transfer modeling and tree mortality processes. She is the modeling co-lead of the Next-Generation Ecosystem Experiment in the tropics project, a 10-year program to better integrate field observations and model development activities. Dr Fisher is passionate about furthering the development of an open, collaborative and productive scientific community around the CLM and FATES models, and to that end, spends much of her time facilitating and assisting with community-led model development projects. She is currently on collaborative leave at CERFACS, Toulouse, France.